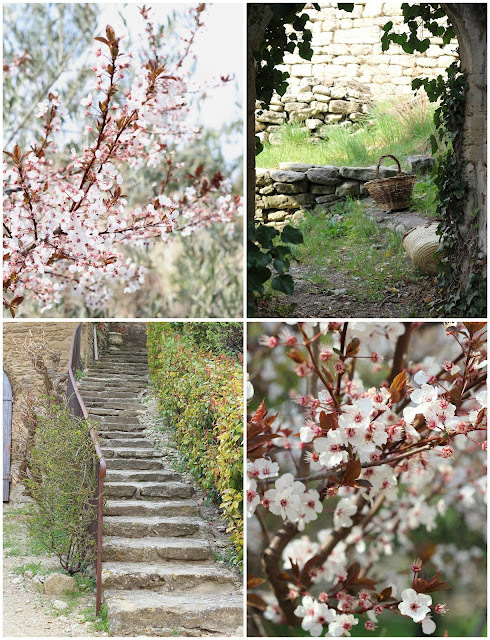 We are having a gorgeus springtime here in Provence and I do love go onto my very secret garden looking for wild vegetables . It's the season for detoxing and what's better than walking under the sun and picking up something that Mother Nature so generously gives us ? 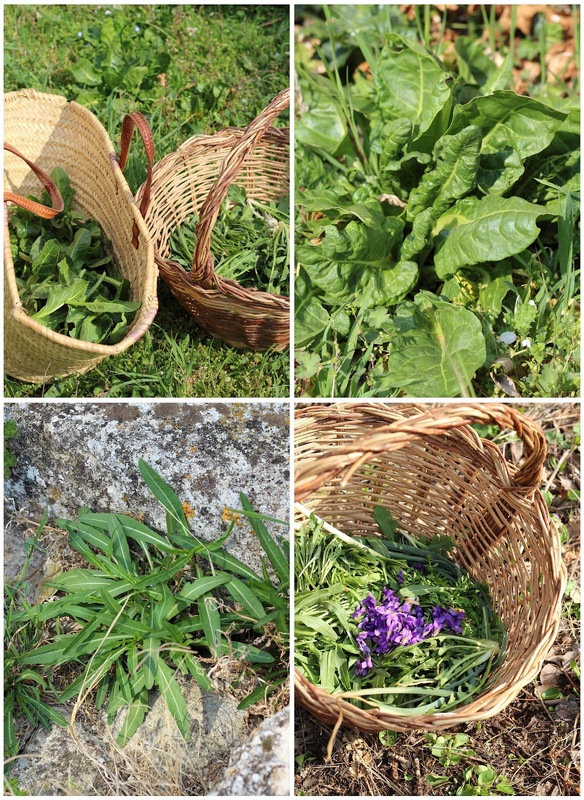 One basket for that we'll be eating raw and the other one for herbs that will be cooked...I like to come home with my herbs cleaned & arranged ,ready to use . Can you imagine that it's amongst the ruins of some village that you can find the biggest variety ? 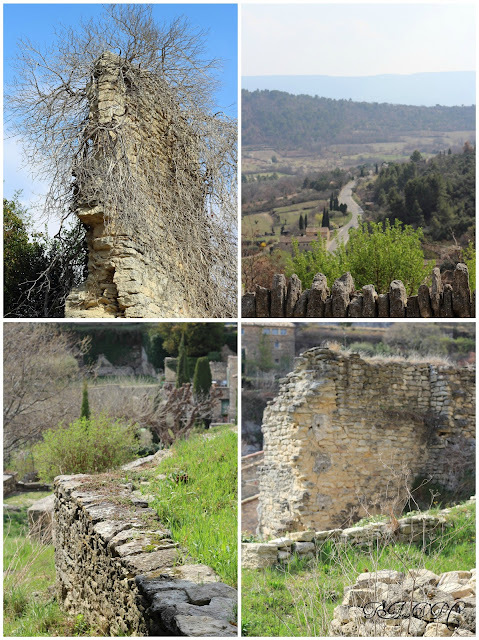 I speak of Luberon , obviously : in the countryside we can't find so much , because of all the chemicals products that have been used along the years. Things are changing now , and a new generation of young farmers is coming .I'll tell you in a next post about them. When we came back we had an amazing wild rocket ( not be confounded with arugula ) and Dandelion salad with fresh eggs from the farm nearby : this is one of my favorites , a real luxe to me. The combination between the bitterness of dandelion and the spicy taste of wild rocket is so good that you don't need to add anythyng else , just a normal seasoning.Accompanied with eggs is an healthy and light lunch or dinner . Your liver will thank you ! Wash the herbs almost three times , till the water is clear , then put them in a bowl. Prepare a vinaigrette : in a cup put some fleur de sel ( how much as you like ) a drizzle of apple's winegar t dissolve the salt , extra-virgin olive oil and freshly grounded black pepper , mix well and add to the salad . Cook the eggs : raise the water to boil , put gently the eggs inside and let cook for five minutes , drain and cool with cold water . Serve with the salad and enjoy ! You can find here a traditional provençal recipe with wild blettes . Grazzie Babi ,in realtà é pure una non-ricetta che ho messo ma lo scopo é più "culturale " in questo post .Buona Giornata ! Eh eh....son felice se si sente ! Grazie! Magari!Scommetto che in dordogna é strapieno d'erbe ! Mais attention, dans les vieux murs dans le Luberon il pousse de la petite cigue qui ressemble beaucoup à du cerfeuil ou du persil : ne pas confondre !! Bonjour Pascale , je comprends que la Provence te manque ! Merci pour "le truc" des buttes ,je ne savez pas , en Italie j'allais chercher sous les feuilles des platanes pour les avoir blanchi et c'est vrai que c'est delicieux . Merci aussi pour le link , je savais que il faut pas confondre mais pour peur de me tromper j'evitais de cueillir ,alors l'explication a été trés utile . Ciao Giuseppina, trés jolie l'uovo sulla rucola è un'immagine così bella che mi fa venire voglia di farlo subito! Bellissime le foto dietro il nome del tuo blog; quando vuoi ti faccio un post "dedicato"
Il mio cuore gocciola Giuseppina!! che meraviglia, sogno di vedere la Provenza fiorita. Credo che nemmeno quest'anno sarà possibile. Bellissimi colori, fai quasi sentire i profumi con questi scatti.